For something different, I wanted to do a “round-up” of some of my posts these past few months, in case you missed something. Enjoy! “The earth laughs in flowers.” Pay attention to fleeting moments of beauty… a flower in bloom, a tree in transition with its fall colors, a smile one a stranger’s face. Blink, and you may miss it. Take some time today to slow down and observe and just breathe. What are you doing this fall? Do you skip from Halloween right on to Christmas? Or do you take a moment to be #thankful first and decorate for fall like me? Did you like this round-up format? 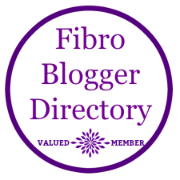 For more inspiring quotes or information on fibromyalgia and chronic pain in between my blog posts, follow me on Twitter and Instagram at @photobaugh. I’m still working on getting my body to behave better (Chiro and PT have shown me some things that help to elevate pain and/or be less afraid of it.) Holidays are overwhelming to me and have been for many years. I think that is a state of mind, not fibro. I try to get excited but it lasts a second or two. Ha. What part of Texas are you in? I’m new to the dfw area. I was in Houston for 38 years. I have to pace myself and not take on too much. Cheers!